Equipment Used: Kodak easy share C633 Digital Camera, Kodak Easy Share Digital Camera CX633, Canon Power shot Digital Camera, 2-Samsung S73 Digital Cameras, Olympus stylus verve 4.0 Digital Camera, Sony cyber shot DSC-W55 Digital Camera, Kodak Easy Share Digital Camera. Sony IPD-P210 digital voice recorder, Olympus VN-1000SE digital voice recorder, Olympus Digital Recorder VN-3100PC, 2-Olympus VN-240 digital voice recorders, Olympus Digital Recorder VN-2000, Olympus Digital Recorder VN-4100PC,Radio Shack digital voice recorder, CA RP5022A Digital Voice Recorder. This was SJGR's first visit to this historic building in Philadelphia, PA. The Historical Society of Frankford includes a museum and library in addition to the history of the Northeast Philadelphia neighborhood known as Frankford. They work to preserve, document, and act as an advocate for the community. During the course of the investigation, investigators experienced every thing from smells to impressions of celebrity names, much of which was perceived in the basement area. 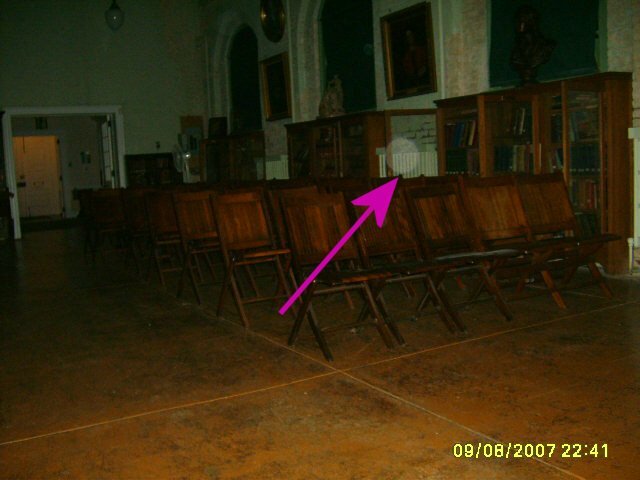 The physical evidence collected consisted of 4 EVPs and 31 positive photos with energy orb anomalies in them. 2.8% of positive photos obtained falls within the normal range for any location, but some photos correspond to events investigators were experiencing at the time the photo was taken. 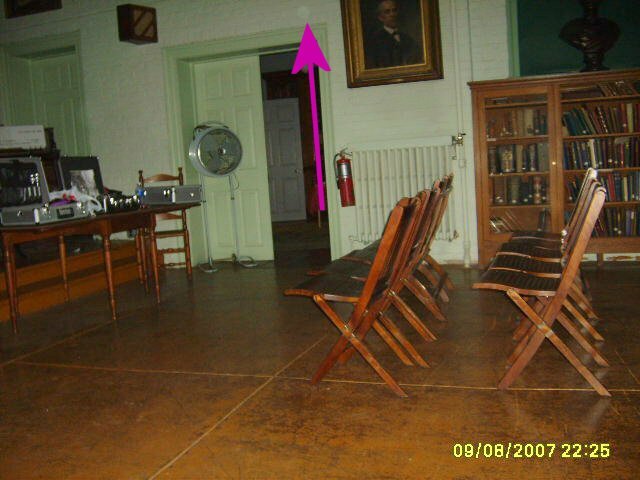 Neither anomalous EMF nor temperature readings readings were recorded during this investigation. However, the motion sensor detected unseen movement in an area without investigators on one occasion. 10:08pm - Investigator Haines took this photo on the 2nd floor after feeling as though someone was walking behind Investigator Davis. 10:25pm - Investigator D. Perley took this photo at random near the Kitchen doorway. 10:41pm - Investigator D. Perley took this photo after she and Investigator Flatt smell garlic in the theater. 12:24am - Investigator Haines took this photo after Investigator Hewitt felt like someone was sitting to his right in the rear of the theater.